This James Convertible Tricycle is a very rare machine. Tricycles were expensive for companies to manufacture. As a result, they were loathe to over-produce them and most were only made to advance order. 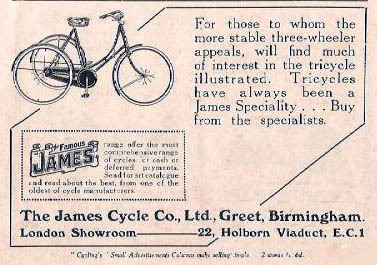 However, James Cycle Co had the best reputation as a tricycle manufacturer and were obliged to make sufficient for shops and agents to display. Their solution was to design a convertible, which allowed them to produce one model rather than separate ladies’ and gentlemen’s versions. They patented the crossbar device that could be moved around to raise or lower it accordingly. In fact, chaps who rode the Convertible often found it more convenient to keep the crossbar lowered, so they could mount and dismount from the side rather than from the rear. 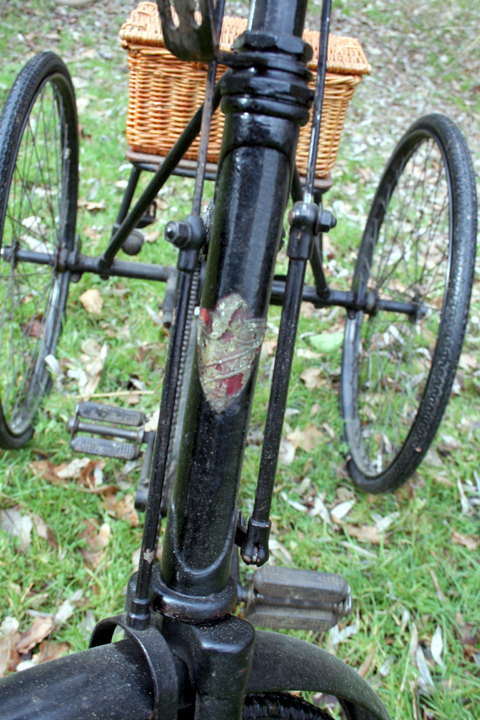 This particular machine is fitted with another very useful device – an accessory rear rack, which allows it to carry a basket. With increased carrying capacity, a tricycle in the 1920s was considered the bicycle equivalent of a motorcar with a rear boot. (In the 1920s most British cars did not actually have a boot for luggage, but instead carried a large basket or trunk attached to the rear bumper. 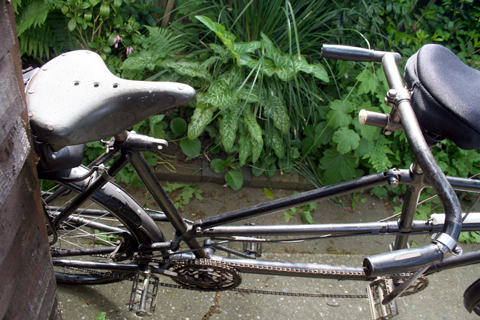 Comparing the rear axle (above) with the catalogue description below, you can see that this machine is fitted with the ‘De Luxe Back Axle’ as supplied to the ‘Gentleman’s Model No 25.’ The De Luxe axle, with external contracting band brakes at the inner ends of the half-axles, was introduced in 1914. 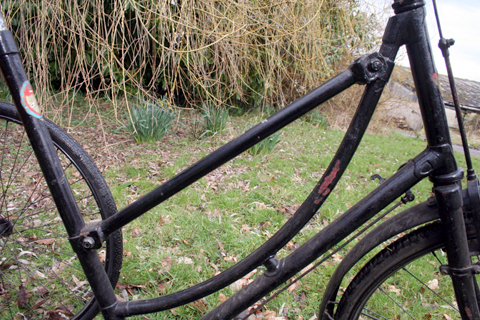 The James Cycle Co patent convertible crossbar was also used on James tandems. Definitive information on James tricycles can be difficult to obtain; the James factory was almost completely destroyed in an air raid during World War Two and, along with it, went all the company records. Information on pre-war James machines has, therefore, been pieced together, mainly from old catalogues. You can see a range of James products in this sample from the 1928 catalogue. The company also manufactured commercial tricycles and tradesmen’s bikes, which evolved into the motorized three-wheeler ‘Samson Handyvan’ of 1929. 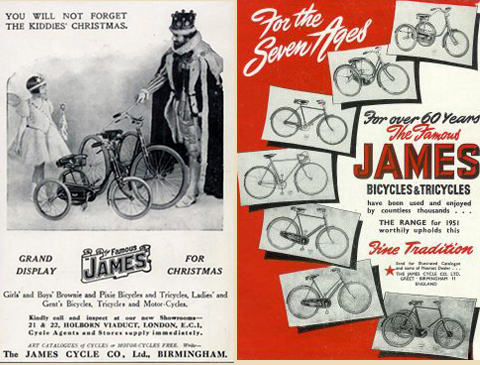 In the ads below you can compare the James children’s tricycles of 1926 (on the left) and the range available in 1951.